Mimir (pronounced “MEE-mir;” Old Norse Mímir, “The Rememberer”) is an exceptionally wise being and a counselor of the gods. From the surviving sources for information on Norse mythology, it’s impossible to tell whether he was considered to be an Aesir god or a giant. Mimir’s home seems to be a well called Mímisbrunnr, which is probably identical to the Well of Urd. Odin famously sacrificed an eye to Mimir in exchange for a drink from Mimir’s well. 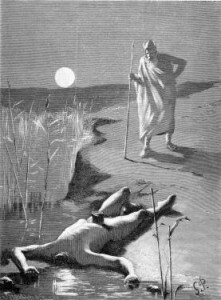 Mimir was killed and beheaded by the Vanir during the Aesir-Vanir War. Upon seeing the severed head, Odin embalmed it with special herbs and chanted magical songs over it to preserve it. He consulted the head in times of need, and it continued to dispense incomparable advice. As sparse as our present-day knowledge of Mimir is, these roles seem to suggest that the Vikings thought of him as the being who helped the gods retain the wisdom of ancestral tradition, which served as an invaluable guide for their actions. Simek, Rudolf. 1993. Dictionary of Northern Mythology. Translated by Angela Hall. p. 216.